The Sustainable Energy Challenge is calling on local students [working as either individuals or in teams] to provide innovative solutions to the challenges of Bermuda’s energy production and consumption, with the top solutions to be awarded prizes including a pool of $1,500 educational grants. Solutions could range from maximizing the utilization of existing power sources to the development of new methods for producing sustainable energy, or they could address conservation through simple methods of cutting back on power consumption through conservation or green building methods. With sponsorship from RUBiS Energy Bermuda Ltd. and the Government of Bermuda’s Department of Energy, the Youth Entrepreneurship Initiative is conducting the Challenge as a part of Global Entrepreneurship Week. The top solutions, as decided by a panel of industry experts, will be awarded prizes including a pool of $1,500 educational grants. Graham Redford, Managing Director of RUBiS Energy Bermuda Ltd, says: “RUBiS is excited to be able to partner with the Department of Energy and the Youth Entrepreneurship Initiative on the Sustainable Energy Challenge. He continued: “The UN estimates that by the year 2050, the global population will have increased to nine billion, all of whom should have equitable access to food, water, shelter, education and healthcare. “It is easy to think that as a small Island, we are immune to the challenges that larger countries face, but we have a responsibility to the global community in which we operate to change the way in which we live, work and play. A Government spokesperson said, “The Sustainable Energy Challenge will be launched on the 28th of September [today] with a submission deadline of November 1st. All submissions must be an ‘electronic storyboard’, either a PowerPoint or video presentation. 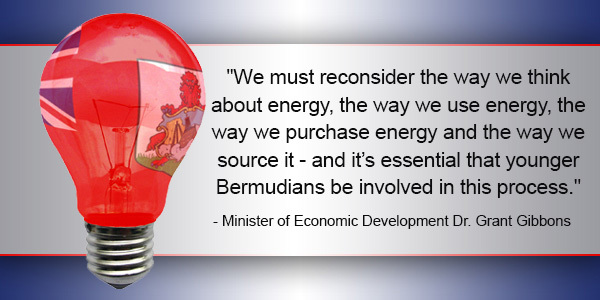 “We must reconsider the way we think about energy, the way we use energy, the way we purchase energy and the way we source it – and it’s essential that younger Bermudians be involved in this process,” said the Minister of Economic Development Dr. Grant Gibbons. “We look forward to receiving the submissions to the Sustainable Energy Challenge activity and capturing the imagination of young Bermudians on the concept of sustainability. I just hope this isn’t where the “qualified” research ended up! Please don’t give away your ideas for ‘a widow’s mite’ when you can make a mint (fortune) that will have a positive impact on the world–not only Bermuda. A fortune awaits the man or woman who invents even the simplest article if it serves humanity well! Furthermore you should protect your ideas through patents, copyrights,trademarks and non-disclosure agreements (NDA). If you are interested in developing your ideas (taking them from concept to fruition; A-Z; or the napkin stage to the marketplace)and enrich your own lives and help others in need, instead of making the rich richer, then send an e-mail to me at nanapeggy@livenet.bm and I will refer you to the source who can help you to achieve this. All you have to do is tell me you have an idea. You must not disclose what it is.